Green Arrow was victorious in crippling the Ninth Circle, but taking down the global criminal financial empire left Oliver and his allies bruised, broken and scattered to the wind. With Emiko in Japan with her mother Shado and Oliver, Black Canary and Diggle trapped on a mysterious island, everyone must fight for the lives! 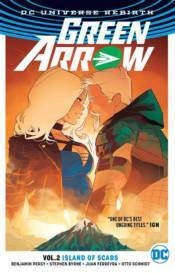 Don't miss these tales from GREEN ARROW #6-11.